Google has started testing its balloon-powered high-speed internet service in Sri Lanka this week as part of an effort to get remote parts of the world online. Two thirds of the world’s population does not yet have internet access, Google says on the Project Loon website . The tech giant’s network of balloons travelling on the edge of space aims to connect people living in rural areas, help fill internet coverage gaps and bring communities back online after disasters. Once in the stratosphere, the balloons will be twice as high as commercial airliners and barely visible to the naked eye, according to Google. One of the three balloons that will be used in trials entered Sri Lankan airspace on Monday, having been launched in South America, the government’s information and communications technology chief Muhunthan Canagey told AFP . Project Loon began in June 2013 with a trial in New Zealand. The technology has also been tested in California, Brazil and in the Australian Outback and Indonesia . The Sri Lankan government has said it will take a 25% stake in the joint venture with Google, but is not investing any capital. In return, it will give Google spectrum for the project. A further 10% stake will be offered to the country’s existing telecoms providers. It is hoped the balloons will expand internet coverage, increase speeds and reduce costs of data services in Sri Lanka, which became the first country in South Asia to roll out a 4G network. 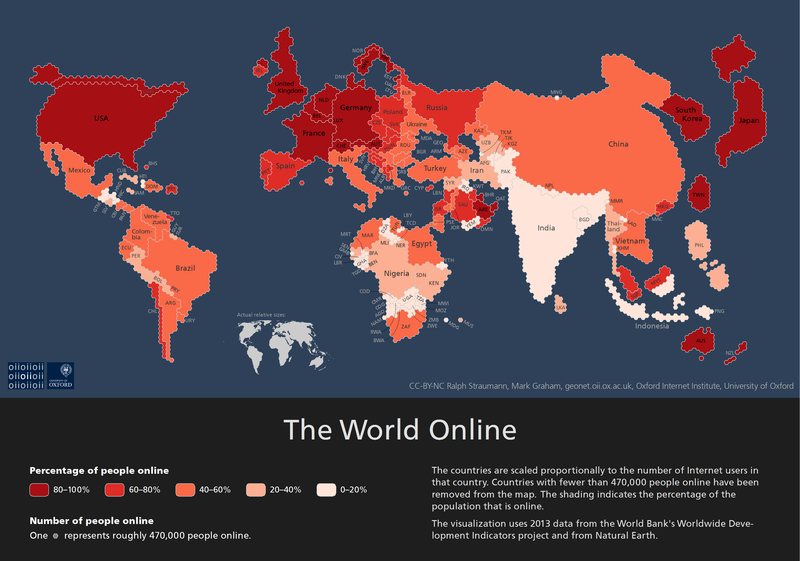 The United Nations estimates that today 43% of the world’s population are connected to the internet, mostly in developed countries. The UN aims to connect all the world’s inhabitants to affordable internet access by 2020. The World Economic Forum’s Networked Readiness Index assesses nations based on their internet capabilities and suggests solutions to help countries make the most of ICT advances. The map below shows how well various countries are using ICT to boost competitiveness and well-being. How do the Loon balloons work? The network of helium-filled balloons travel in the stratosphere approximately 20km above the Earth’s surface. The balloons move with the winds in the stratosphere, which vary in speed and direction. They go where they’re needed by rising or descending into a “layer” of wind blowing in the right direction, according to the Project Loon website. As the wind moves a Loon balloon forward, it hands the signal on to another one floating into the same area. The balloons can then be coordinated to form one large communications network. The balloons have a lifespan of about 180 days but can be recycled. Their electronics are powered by on-board solar panels.